“We don’t believe the government anymore. All their decisions are just ink on paper for us.” –Omar Ali, a Kurdish-Syrian activist. Thirteen human rights groups have signed a press release condemning the Arab League’s support of Syria’s bid for a seat on the UN Human Rights Council. The regional group for Syria has the same number of nominations as they have seats available, so at this point Syria seems guaranteed a seat. While the human rights groups feel that support for Syria’s bid is an “an insult to the UN body and its mission”, a quick glance at the current membershipshows Syria, who have killed some 220-250 of their own citizens in recent weeks anddetained and tortured close to a thousand, should feel right at home. While Libya was recently suspended, the council still has Bahrain, Saudi Arabia, the United States, Gabon, Nigeria, Cameroon and enough other countries with sordid human rights records to constitute a jury of their peers. They need support from half of the members, when the vote takes place on May 20. The Ministry said it will not be lenient with such terrorist acts and it will work strictly to enhance security and stability all over Syria and pursue terrorists everywhere to bring them to justice.The Ministry called on the citizens to tell about the whereabouts of terrorists and suspects and not allow them to exploit the freedom atmosphere to shed blood and corrupt public and private properties. Assad’s government has so far released political prisoners and detained many more, replaced the government while retaining the Assad family and friends who control all government, military, intelligence and economy, and lifted the emergency law while retaining all of the other laws that allow the Assad government to operate as it pleases, such as guaranteed immunity for crimes committed in the line of duty for the secret police. Protesters were once again unimpressed by the reforms and promised to continue protesting. Protesters are asking for freedom and human dignity, the release of the rest of the political prisoners, freedom of speech, and legalized political opposition groups. Increasingly, they are also demanding regime change. Hours before announcing the new bill, security forces killed a reported 17 people during anattack on protesters in Homs on Sunday night. Syrian police have also reportedly arrested opposition figure Mahmoud Issa. More protesters were killed today, according to SANA news agency and others. Amnesty reports at least 26 more protesters have died in recent days, bringing the total to some 220 over the past month. On Sunday, security forces reportedly killed 17 protesters in Homs and three mourners at a funeral in nearby Talbisah, with five more protesters reported killed in Latakia on Monday. A tribal leader, Muhammad al-‘Aliwi, also died in custody on Monday, possibly as a result of torture. It is unfortunate that it took a Washington Post article on US involvement in Syria for the US government to feel concern, and that it chose to do so based on the disclosure of their actions rather than the actions. US State cables published by the Washington Post have illustrated reason for concern over US involvement for a very long time, and have also shown that US actions have been known to the Syrian government for a very long time. Much earlier, cable 06DAMASCUS701 dated February 21, 2006 describes the reaction of Syrian opposition groups to a public announcement by the US that it had designated five million US dollars for the Syrian opposition. The embassy was told at that time that such actions could be very harmful to the opposition’s efforts, and that the human rights and civil society activists were left with the impression that the US government saw them as just another “chip in the game” and were not serious about helping them. The US government was perceived as either naive or uncaring. It was also pointed out that anyone visiting the website the US government had set up for the program would instantly be targeted by the Syrian government. Accepting foreign funding is illegal in Syria, and anyone caught would be accused of treason and face the death penalty. The most likely applicants for the funding, according to the embassy contacts, were the Syrian government themselves. One contact described the funding as a terrible idea that would be used by the regime to discredit the opposition and had already made the opposition look like US agents in the eyes of “most Syrians” even with no government effort. The US was told that funding would help the Syrian regime consolidate its position. One dismissed it as a stunt with a small amount of money that would make no impact (as previous US funding of the opposition had made no impact) and said that it had angered most Syrians who resented the US interference in their affairs. It was also pointed out that, for the damage caused, five million dollars was a very low amount compared to the 75 million pledged to the Iranian opposition. Today US State Department spokesman Mark Toner said the US was not working to undermine the Syrian government, but rather to “promote a transformation to a more democratic process.” The first half of that strategy is working excellently well, as US involvement has contributed more than any other factor to keeping Assad in power and attracting suspicion to any dissidents. But promoting democracy requires a better understanding of what democracy actually is. In the US, where the last “democratic” election cost an estimated US$5.3 billion, the basic premise of a democracy as an indication of the free will of the citizens has been lost and is now equated with money spent. The Syrian government has very effectively cast doubt and suspicion on the identity, motivations and backing of the Syrians protesting this year. Even the snipers shooting people have had their identity questioned. If the US government was using its embassy to undermine the credibility of Assad’s opposition, they have done a very good job. The list of people imprisoned, missing and killed since the protests began is now at 925, as what ought to be a straightforward matter of removing a corrupt and sadistic government has become a game of propaganda and suspicion with no one ever sure who they are fighting against or beside. 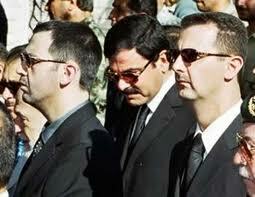 al-Assad (right) with his brother Maher al-Assad (left) and brother-in-law Assef Shawkat (center) in 2000. Today protesters in Dara’a destroyed a statue of president Bashar al-Assad’s older brother Basil al-Assad and reportedly burnt down the State TV building in Dara’a and set fire to a Baath Party outpost. Al Jazeera’s correspondent Cal Perry reports that the army has now been deployed in large numbers to Dara’a. The government’s earlier decision to arm the police force with electric batons instead of live ammunition was reversed today. Syrian state TV (translated by Al Jazeera) said repeatedly today: Over the past Fridays there were a lot of demonstrations in which armed groups used weapons to kill people and security forces – and though we understand that protesting is a right of the population, we can no longer allow chaos to take place and official buildings to be destroyed. 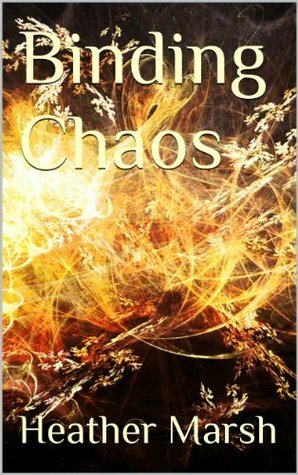 So we will use all the means to stop the chaos from taking place. Protesters are calling for people to come out tonight in great numbers in other cities to take the pressure off of Dara’a. Amnesty is now putting the death toll in Syria over the last three weeks at 171, with the majority killed by security forces firing live ammunition at protesters. This list detailing all people people imprisoned, missing and killed since the protests began, has now reached 770. Amnesty confirmed another eight people killed today, six from Dara’a and two in Homs, but they say the confirmations from today could rise significantly. A doctor in Dara’a told CNNthat 22 unarmed civilians were shot dead in just Dara’a today. The Syrian government said it was nineteen of the security force. From AllVoices, Amar Qurabi, president of the Syrian NGO National Human Rights Organization, reported a total of 22 people dead in three cities. “We have a list of names of 17 protesters killed in Deraa (south) and we have been informed of the death of two protesters in Homs and three in Harasta.” Reuters also puts the death toll in Dara’a at 17, from a “hospital source and activist.” NewsTsar has graphic videos from a mosque in Dara’a. President Bashar al-Assad signed a decree yesterday to finally (after a fifty year wait) give Syrian citizenship to tens of thousands of Kurds in Syria. 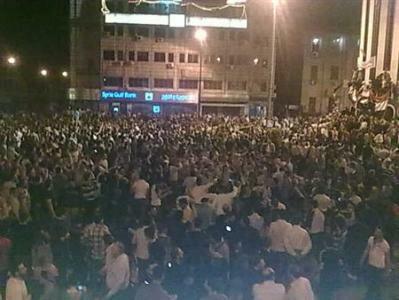 There was still a huge protest today in the Kurdish city of Amouda, which does not seem appeased. There is no indication that Assad plans to stop or curb the violence directed at the protesters and open a real dialogue or implement the changes wanted by the protesters, particularly the scaling back and reform of the security and intelligence forces run by his brother Maher and brother in law Assef Shawket. 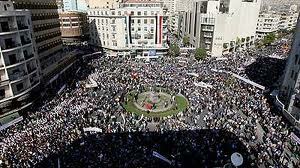 Syrian protesters have vowed to come out and protest every Friday until the government meets their demands for meaningful change. Previous WL Central coverage on Syria here.